EPL-watchers surely groaned yesterday -- it was audible here over the regular Manhattan din -- upon learning Roman Abramovich's bank account is over $13 Billion larger owing to Gazprom's acquisition of 72.7% of Russian oil group, Sibneft, controlled by Mr Abramovich's Millhouse Capital entity. The groan reflects the disappointment that Chelsea will have more money with which to distance themselves from mortal clubs throughout Europe by buying up even more of the most talented players. The jealousy as well as the valid complaints of unfairness manifest these days in the chant "Boring, Boring Chelsea" heard around most grounds except Stamford Bridge. If you think winning is boring, then you'd have a point. If people are sore, it's because Abramovich's willingness to spend on players has an unnatural quality to it -- there is no individual or corporation around with that much money to spend in an unprofitable pursuit -- and also resentment exists that the spending has diminishing returns for Chelsea itself while preventing other clubs from attracting the good players. If people are concerned for an unbalancing effect on football, they can hardly be criticized. Nevertheless, Chelsea must actually go out win on the pitch, and this they have done in an unnatural fashion -- setting a League points record in Mourinho's first year. The money appears to be a start, but it takes brilliance to deliver. One wonders if Mourinho will need to move to a Bournemouth or Wrexham to prove his value one day, so overshadowed is he by the curse of Abramovich's plentitude. Mourinho is establishing a winning era at Chelsea based on a large squad with two near world-class players at each position, unusual fitness and a disciplined counter-attacking style of football in which shape is co-equal with patience. The clean sheet is the primary objective: clearly Mourinho's mantra is 'Above all, do not get scored upon.' That is the formula to winning a lot and gaining the winning habit. In part this does take good backing; but much is down to sheer competency. Is it the cat & mouse football of the early Group Phase of the Champions League that brings out inspired coverage -- despite a soporific score, Chelsea nil, Liverpool nil? McCarra discusses the incorrect notion of "Boring, Boring Chelsea" which is being sung lately at all grounds -- and soon even at Stamford Bridge. 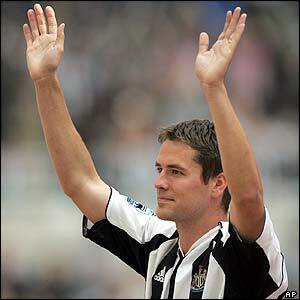 Michael Owen, here, is visibly humbled by the 25,000 Newcastle fans who showed up to greet him warmly at St. James Park. The reception must feel to him he's made a good decision and will help the soreness of not returning to don a red shirt. In the signing photos, you can see the satisfaction on the faces of Freddy Shepherd and Graeme Souness -- both are unemotive types -- who rightly feel their work rewarded. They have reeled in a big one. Anybody who cares about quality football will relish the chemistry possible at Newcastle who have Carr, Parker, and now Owen (but lose Jermaine Jenas) alongside Alan Shearer as a possible long-term mentor. It will be interesting how Owen and Shearer play together, if ever they do; and how Souness adapts the team's style to factor Owen's abilities in. Despite that Newcastle United are the only ones to meet Real Madrid's transfer terms, one does not see Michael Owen in vertical black & white stripes. And it is hard to imagine Alan Shearer's, Greame Souness's and Freddy Shepherd's full-court press having any effect on Owen, whose primary wish is to return to Liverpool. Owen would consider loan terms for a year Tyneside, but Newcastle shun the notion. ...for Wales this coming Saturday at Millennium Stadium, Cardiff. Article at The Guardian. *Owen is suspended for the Wales game. # My first team choice for Wales. "He is a fantastic player and makes us a better team when he is in it," said Gravesen. 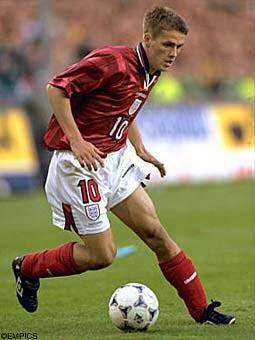 Owen will go back to England -- to either Liverpool or Manchester United -- to get full playing time this World Cup year. Is a Top-4 finish for Spurs out of the question? Look what a little confidence can do, when we have written off Whitehart Lane as jinxed for how many generations, now? 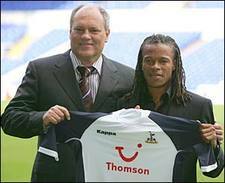 Bringing in ex-Holland international, Edgar Davids, makes a large difference. And now Andy Reid's footballing artistry can really shine in North London. Any team seeking to beat Chelsea FC needs to consider the middle channel, the start of most Chelsea counter-attacks: Claude Makelele. Giving a striker and a midfielder responsibility for stifling Makelele can negate the rhythm and spring in Chelsea's ability to link quickly when they take over possession. The English Press should be shot for overreacting to this friendly result. They dis-honor Denmark -- a very good team -- while taking no realistic account of the present condition of England. England players are right at the end of all the adrenalin and fatique of preseason training and the pent-up emotions of the first league fixtures in the EPL. Moreover, many England players have come off of extremely tiring tours of the USA and the Far East -- in some cases both. A result like this will humble everyone and concentrate minds just at the right time for the World Cup qualifiers on Sept 3 (Wales) and Sept 7 (Northern Ireland), where travel will not play such a factor but a bit of rest will. Exasperation at this point is a waste of ink & energy. It achieves nothing and does not even sell copy.